Photo Credit: Atlantic City Electric. Pictured left to right are Ben Wurst, wildlife biologist, Conserve Wildlife Foundation of New Jersey; Ed Kaminski, senior supervising engineer, ACE; Cristina Frank, lead environmental scientist, ACE; and Mike Garrity, senior supervising scientist, ACE. Atlantic City Electric (ACE), in collaboration with the Conserve Wildlife Foundation of New Jersey, recently held an Avian Protection Educational Event to promote a better understanding of how Atlantic City Electric helps protect birds and other animals, while also helping improve electric service reliability for customers. ACE environmental scientists Cristina Frank and Mike Garrity detailed the various types of migratory and breeding birds that may perch or nest on power lines, including ospreys, which frequently nest on utility poles. They discussed various types of devices placed on wires and other infrastructure designed to minimize the risk of birds and other wildlife from coming in contact with electric wires and equipment. ACE senior supervising engineer Ed Kaminski explained how avian protection is an integral part of the design phase before constructing any new infrastructure projects or upgrading existing infrastructure. “We are in constant communication with our environmental team, and, when necessary, we’ll enhance our infrastructure to minimize the risk to birds while helping reduce the number of related power outages to create a more reliable electric system for customers,” Kaminski said. 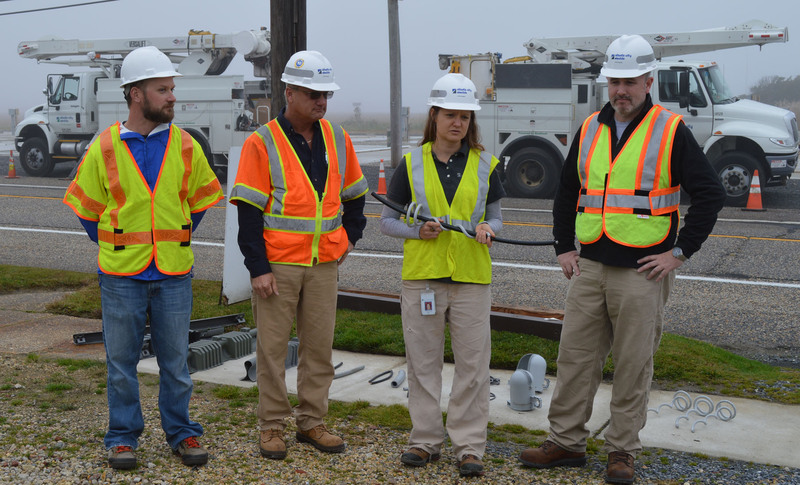 Atlantic City Electric recently completed infrastructure enhancements in Cape May, Ocean City and Strathmere, N.J., that addressed risks to avian wildlife. As a result, the company has not seen any bird-related incidents since in these areas. Also as part of the event, Ben Wurst, a wildlife biologist with the Conserve Wildlife Foundation of New Jersey, discussed the foundation’s role in helping manage and protect ospreys through man-made nesting platforms that provide a safer nesting alternative than utility poles. ACE partners with Conserve Wildlife to identify and address risks to birds throughout its service territory. Birds routinely use power line poles and towers as perches to establish territorial boundaries, nest, hunt, rest, find shade and feed. Utility poles often provide perching or nesting opportunities in areas where few natural perches or nest sites can be found. If the configuration and location of utility structures are in areas where birds are attracted by favorable habitat or are in a migratory path, the chance of electrocution and/or collisions increase.